Hello all. It wasn’t very nice of me to dissapear like that. My only excuse is the usual one times 10. My husband had a massive heart attack and had to have Triple Bypass. He did great throughout. I got crazy. And my daughter got crazy, too. I suffer with chronic depression and some anxiety that has worsened over time. It’s no joke. I’ve been under a cloud for the past year with no end in sight, trying to hold it together for my daugheter, who has been having regular panic attacks since last Septemeber. It took until three days ago that I was able to relax enough and just be to think about what was going on in this corner of the world. A lot happened and a lot didn’t. I’m kind of sad that there’s not much activity anymore. A few of the good old reads for me, but noone is quite the same. It’s ok, though. I still feel like putting my dance thoughts on here. I never expected complete anonymity. I hoped for it when I first started blogging, but I’ve moderated my thoughts enough toward the end because I figured someone would find me. I think this just might end up being a more of an anything and everything blog. I think I intended that from the beginning, but dance has been such a grounding point in my life and I “met” so many fun dancers on here that I didn’t want to clutter up their feeds with other posts. But I’m a busy person with a lot on my plate and I may need to get it all out on here. The dance update: I continue to dance. I took off 3 months for my husband’s surgery because I just couldn’t leave him, even with him doing so well. That time was about him, not me. He doesn’t like that I dance and I felt I needed to give him his deserved attention. I’m still a Silver Smoothie. Rhythm has fallen to the wayside. I don’t have the money to progress in that style, end of story. I will be forever bronze and I’m (kind of ) coming to terms with that. I’m still with Teach. Other teachers have come and gone. There’s a new couple who spend part-time at this studio and part-time at another in the corporation. I danced some smooth heats at a MiniMatch (a small comp at one of the studios) and he is great. I plan to take lessons with him occasionally to keep up with Rhythm and possibly add Latin and Social for fun. Teach and I will focus on Smooth. I’m good with this. 😀 I also did my first Showcase (like a show dance) with Teach last month. I dance to Roxie from the movie of Chicago. It was completely out of my comfort zone and great fun. As you can see, I’ve been plowing through everything. I have no events in my future because of the good old money situation. It’s expensive to dance and I just don’t have it. I still home school my daughter. She’s in 9th grade and I can’t believe it! I seriously considered putting her back in public school this year, not because I don’t think I can teach HS, but because of the mental health issues we’ve been facing. Home schoolers don’t get any support without paying for it, and I thought that it would be better for us both to take a break. But then her panic attacks started and she just cried about going to school and I couldn’t do it to her. So I’m stuck. I don’t enjoy homeschooling, but it’s only 4 more years. 3 if she just does it! I can do this. So a long post to return. I won’t promise to be regular; I don’t have it in me to plan enough content for that. But I’m here and I’m reading your stories again. Sorry I missed so much. Happy dancing, all! This is what happens when you don’t go to your scheduled lesson. I was on Facebook and I saw that Teach was promoted to management. Some of his students were writing those heartfelt messages and showing pics. Now who’s my teacher? Sometimes managers continue to teach their long time students (I’m his longest). Do I want to continue at this studio? I’ve stayed for Teach, because no one has fit so well with my personality, you know I’ve tried. I also like the way they teach there compared to the local franchise. You know what? I just gave my mom advice today to stop worrying until you know for sure what’s going on. Seems like I should take that advice for myself. Guess I’m making a call Monday. I was at Barnes and Noble for their YA book festival and one of the authors who spoke said something that hit me. “You can’t create and judge at the same time.” This applies to us dancers (I called myself a dancer!!! ), too. Dance is an art and a sport. Sometimes the weight of technique gets to us. But I know that I need dance as an art form, as well. To do that I need to just go out there and dance without so many evil voices. Just needed to share with you lovelies. I just wanted to drop a quick line to everyone. I’m a lot behind on my blog reading and in updating my own blog. The reasons are the usual ones- I’ve been busy! It’s the end of the homeschool year, work has been overwhelming, and I’m planning the next school year. To reduce my overall anxiety level, I’ve restricted my screen time. It really helps me to rest better and calm down. So be forwarned, one day soon I’m going to read and like all 10 or more posts you’ve written. I’m looking forward to catchin up soon. Until then, happy dancing! It seems like I’ve been sick all year. I’ve had the flu, the stomach flu, colds, allergies and, last week, a sinus infection. I’m not going to debate on why this year seems to be hitting me like a punch in the gut by The Rock, but I do want to see how others handle this problem: When do you not go to your dance lesson? I’m an adult female. I work as a nurse. I know when sick is Sick (with a big S). This is the no-brainer call out of work, cancel all scheduled activites and stay in bed. Fever, vomiting, etc, all warrant a halt of activity. As your fever breaks or the vomiting stops, things proceed to the gray area. I don’t want to sound terrible here, but management expects nurses to come to work if their temperature is less than 101 degrees F. They want us to come to work the day after we stop vomiting even if we can’t really eat yet. I know that this is terrible, but that’s healthcare. I don’t agree with it, but there’s not much I can do about it. Stopping at this thought – It’s depressing and makes my blood pressure rise. But, it is possible to not feel your greatest and still work. Depending on your job and level of contact with other humans, this “not feeling well” could go either way – a stay home or a call out. Stay with me here, this is going somewhere. Dance lessons are a whole other ball game. There is still Sick (with a big S) where cancelling is the only possibility. But when do you go back? This is where it’s hard. I may go back to work but cancel my lesson. Considering how much I love to go to the studio and how many goals I have, why would I do that when I’m merely at the end of a cold? I don’t want to pass anything on to Teach, that’s for sure. But the bottom line is this: It is a waste of money to go to a lesson that I can’t pay attention to. If my brain is floating in the Milky Way, I need to be at home. I cancelled my lesson on the 28th because I was getting a cold, went to my lesson on the 4th because I was feeling better and then got sick on the way down (don’t forget my 2 hour each way trip). I went to that one because of the 24 hour cancellation policy or you’ll still pay for that lesson thankyouverymuch. Thankfully it was only a single lesson. More on that later. How do you all handle illness and lessons? Are you all lucky to have the constitution of an ox? I’ve subscribed to a few subscription boxes over the past year because of my curiosity. Most of them are book related because I have no willpower. January has been all sickness for this family. One after another we’re getting coughs, fevers, aches, sore throats, etc, resulting in cancelled dance lessons, sick days, and doctors appointments. 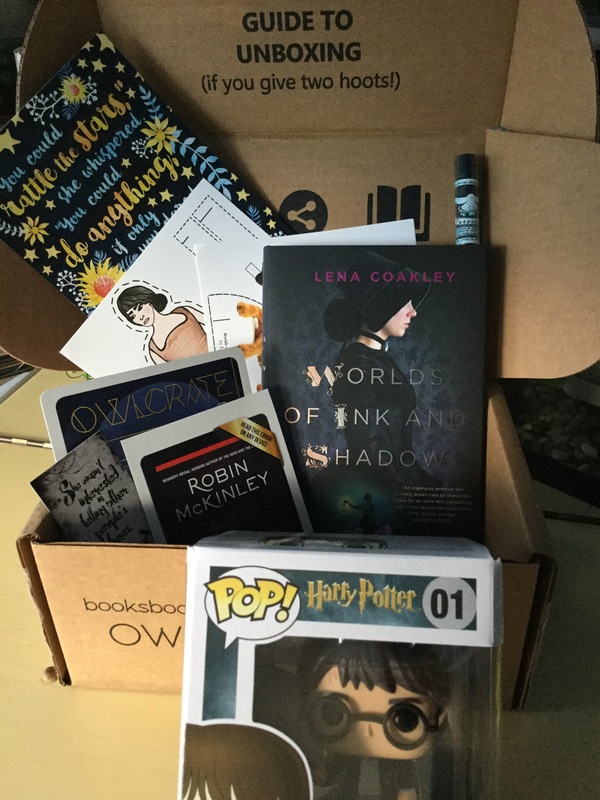 Since I need to be slightly present on my own blog despite not being able to sit upright without vertigo, I’m going to share what arrived in the mail for me today…an Owlcrate! I seem to get mine later than most people, so I doubt this is truly spoiling anything, but, I’m warning those few anyway…the picture of contents is directly underneath this sentence. I wasn’t thrilled with the theme this month. I’m not into magic in my books. I bought a 3 month subscription when there was a sale and you can’t skip months. So people with picky reading tastes need to beware. The book this month is Worlds of Ink and Shadow by Lena Coakley. The synopsis sounds like something I could enjoy. It’s a fantasy rebelling of the lives of the Bronte sisters. The book comes with a letter from the author and a paper doll set. Very cute. There are some other goodies in the box, including: white chocolate-mint lip balm by Geek Fire Labs, and two pieces of art by Evie Bookish. The glaringly obvious item of the box is a Funko Pop! Of Harry Potter. I’m going to get a ton of hate for saying this, especially taking into account recent celebrity deaths, but I’m sick to death of Harry Potter. So this item needs to go somewhere else. October was a very stressful month for me. I wasn’t very interested in reading the books I had from the library; I wasn’t too thrilled about the ones I own either. Here’s what I accomplished book wise in October. On to November I go. I have two weeks off in the middle of the month, but a lot of that time is going to be spent preparing for my dance competition. I have a few more lessons than usual, plus some memorizing and worrying to do. I hope everyone had a great October. I’m going to sit down and write my dance update soon. Hopefully I’ll be able to form complete sentences by then. 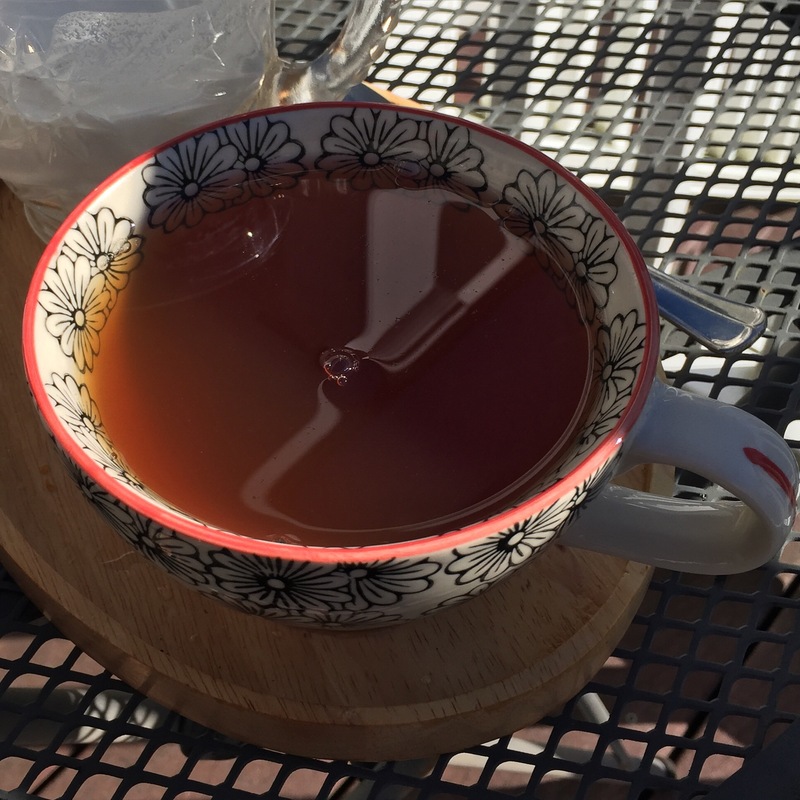 Until that happens, I’m going to sit and enjoy my cup of earl grey tea.